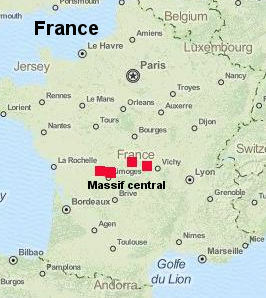 The pegmatites in the French Massif Central contain rare metals, tungsten, tin and uranium and have been extensively researched. In the past they have produced tin, tungsten and uranium, but at present they are actively mined for industrial minerals including clay. A comprehensive summary of these deposits is in the field trip guide book for the 13th SGA meeting, Nancy, France, 2015. 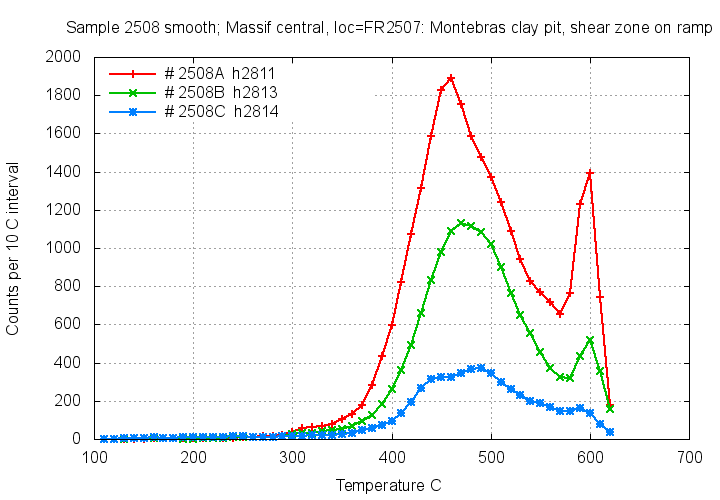 A few of the quartz samples in this study show weak low temperature decrepitation near 270 C indicating the presence CO2 rich fluids, but such fluids seem to be of minor amounts. Other pegmatite deposits (eg Tanco, Canada) often show more prominent CO2 fluid contents. 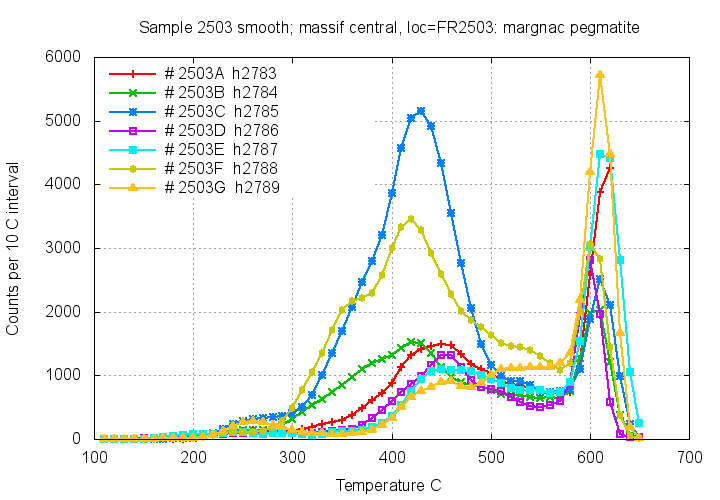 There are many variations in the quartz decrepitation features between 350 C and 550 C indicating multiple fluid events, but the significance of these events is not clear from this data. 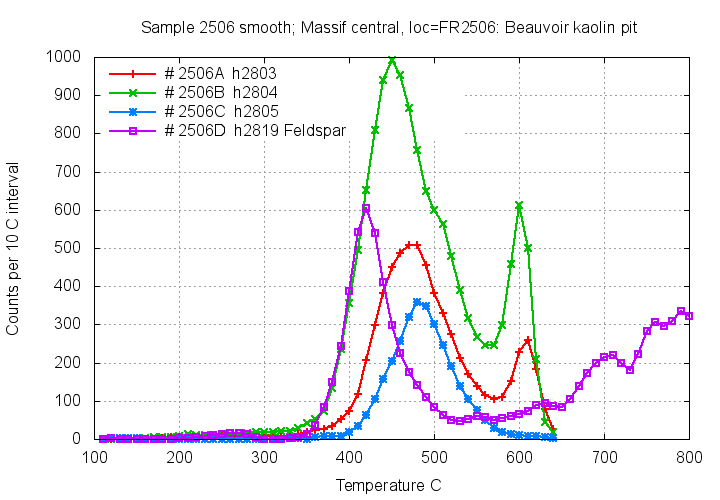 The feldspar sample from the Beauvoir clay pit (2506D) is interesting as it shows that inclusions have been preserved in the feldspar and the weak low temperature decrepitation at 250 C shows that CO2 rich fluids were present during feldspar formation. Such CO2 rich fluids seem to have been less abundant during quartz formation at this same location. Pegmatite samples from the French massif central show interesting variations over this large area, but they mostly lack CO2 rich fluids. It is not clear from this limited data if fluid inclusion decrepitation data correlates with economic mineralization or mineral exploration potential. Only rare centimetre-sized fragments of quartz were present at La Puelle quarry, present in late stage vugs. 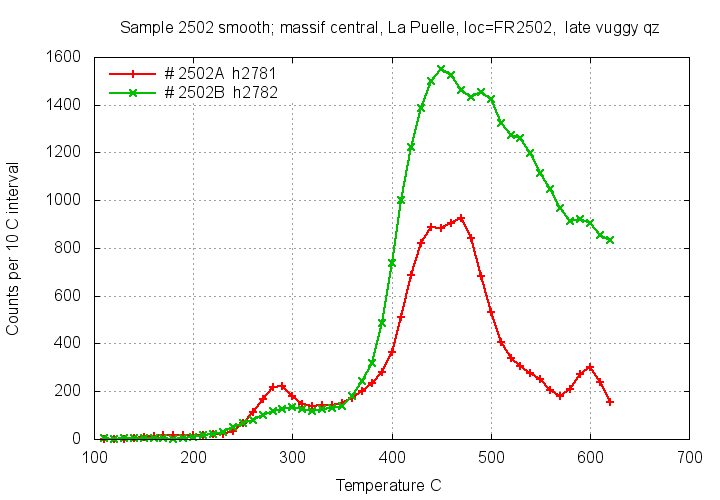 Both samples show significant low temperature decrepitation at 280 C, indicating the presence of CO2 rich fluids. But these fluids may post-date the main pegmatite crystallization event. Quartz samples from the Margnac pegmatite also show distinct low temperature decrepitation near 250 C, due to CO2 rich fluids in the inclusions. 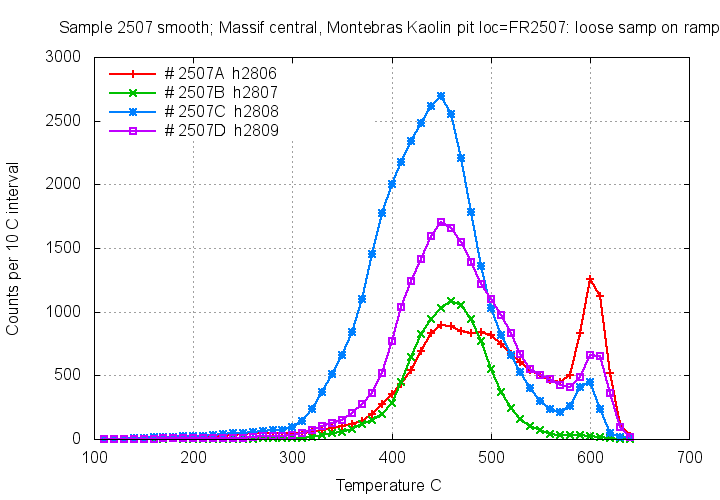 Samples from the Chabannes pegmatite lack low temperature decrepitation, indicating the absence of CO2 rich fluids. Quartz from the Chedeville workings has no low temperature decrepitation peak and lacks CO2 rich fluids. There is only weak decrepitation in these samples - the fluid inclusions are unusually small or rare. At the Beauvoir clay mine pit, quartz contains trace amounts of Cassiterite. These samples also lack low temperature decrepitation and CO2 rich fluids. Sample 2506D was of feldspar, hence the decrepitation above 650 C. The feldspar contains a fluid inclusion population with a decrepitation temperature peak at 420 C, noticeably less than the co-existing quartz peak temperatures of 450 to 480 C. It seems odd that feldspar would form at a lower temperature than co-existing quartz, and this temperature probably does not accurately indicate the crystallization temperature of the feldspar. 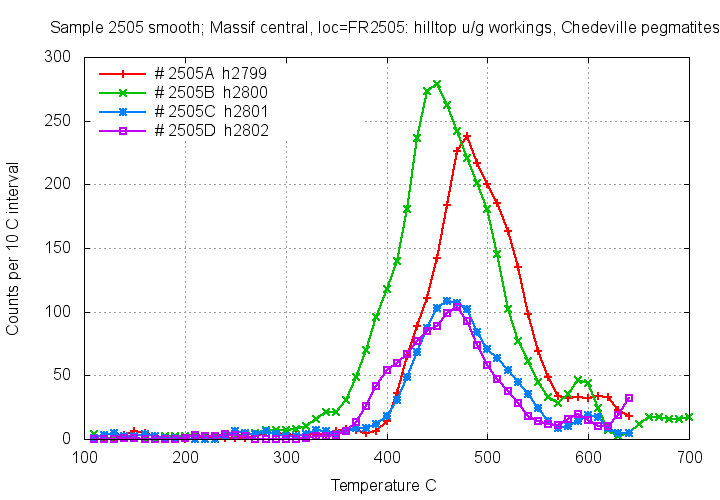 Note that there is a small decrepitation peak at 250 C on the feldspar sample (mauve colour) indicating the presence of CO2 rich inclusions within the feldspar. 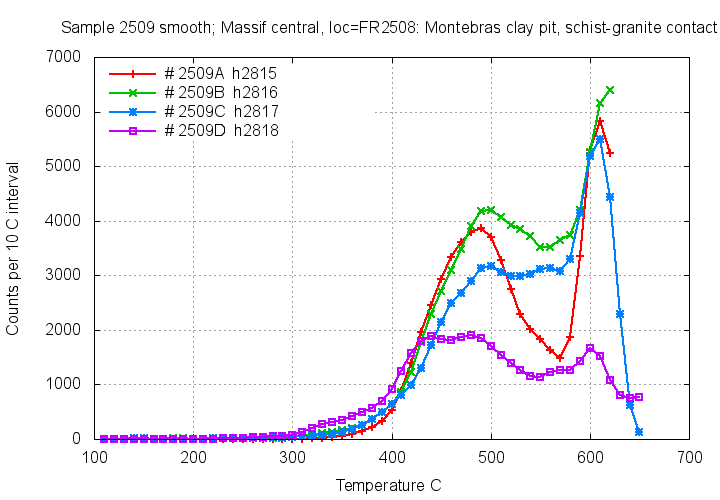 Eleven quartz samples from the Montebras clay mine pit (next 3 graphs) lack low temperature decrepitation and CO2 rich fluid inclusions. 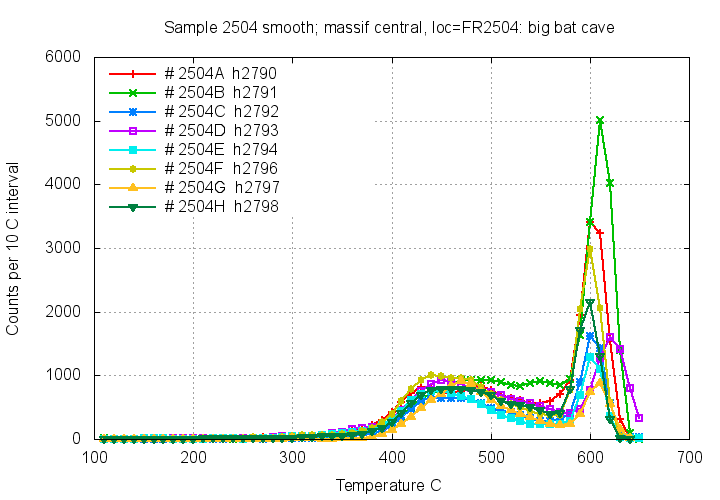 There are some interesting variations with dual decrepitation peaks at about 440 C and 490 C on 3 samples, 2507D, 2508C and 2509D suggesting that there were multiple quartz formation events.